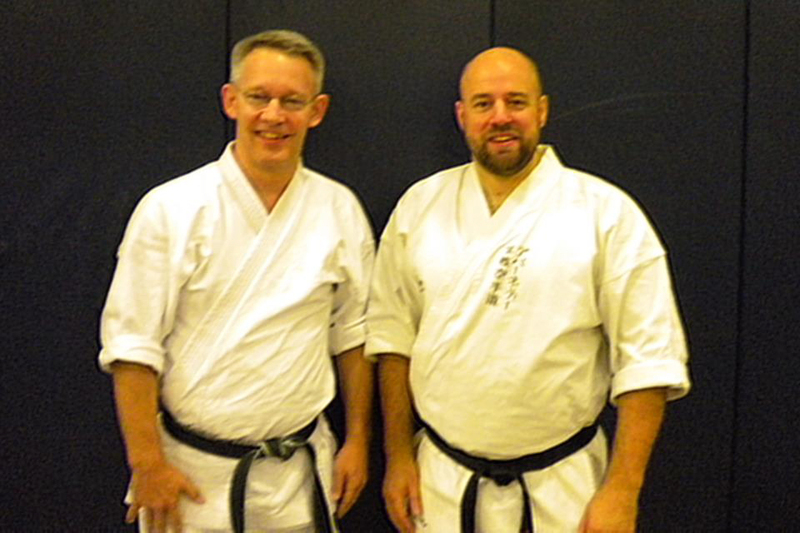 Iain Abernethy is one of the UK's leading exponents of applied karate and kata application (bunkai). His martial arts DVDs and books have sold worldwide and have been translated into other languages. Iain holds a 6th Dan with both the British Combat Association (awarded by Peter Consterdine 8th Dan and Geoff Thompson 6th Dan) and the EKGB (awarded by Doug James 7th Dan). Iain is in great demand on the seminar circuit and teaches many seminars on his approach to practical karate both here in the UK and overseas. 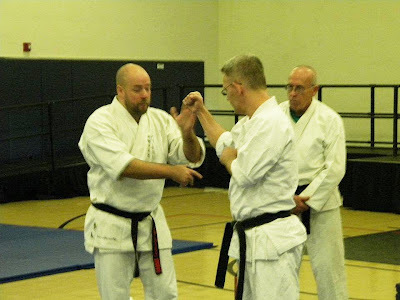 The bunkai that Iain teaches are not prearranged karateka vs. karateka applications. Nor are they static, complex, elaborate or reliant upon finite movement. Iain's approach to karate makes kata application practical, simple, direct and accessible to all. Iain's seminar began on Friday evening with Funikoshi's 9 throws. I was surprised to find myself being invited to be the first "Uke" of the weekend. For those of you that are unfamiliar with the term it would be one who "receives" a technique. The first throw he used me to help demonstrate was "Kubiwa" (To encircle the neck). After that I got to experience "Komanage" or (Spinning top) throw. Over the next two hours we cover all nine throws. Iain shared that of the nine, six, in his opinion had a higher percentage of working and were very practical. On Saturday we began to go through the Pinan / Heian Kata as a complete fighting system designed by Ankoh Itosu. Iain has a very interesting approach. His kata based drills are based on the premise is getting the opponents arms out of the way to get to the head. More specifically the chin and jaw which Iain would refer to as "The on off switch. "A the drills included a focus on awareness in regards to self defense. One primary goal was not being so focused on an attacker that you lose sight of what is going on around you... "Watching out for his mates". The drills start with no resistance. Resistance then increases and moves toward kata based sparring rather than tournament styled sparring. In many drills we started in a clinch or "Boss grip" and pummel for position. One drill that was very fun went like this. Each member of a pair is given a number either 1 or 2. You begin grip fighting then when your number is call you have to break free, and escape. We did this One on one and one on three. We even trained biting and groin grabs. For the groin grabs the target was the belt knot. During grip fighting if you could grab your partners knot you scored a point. For biting it was just chomping BY the ear. The point was not to forget that an assailant might go for those and not to be lax in positioning to protect your assets. Good clean fun. One thing I was most proud of was during a grip fight. we spun our belts around in back and the goal was to get your opponents knot in back. From the clinch I dropped to my right shoulder drove my right arm through his legs and got his knot. 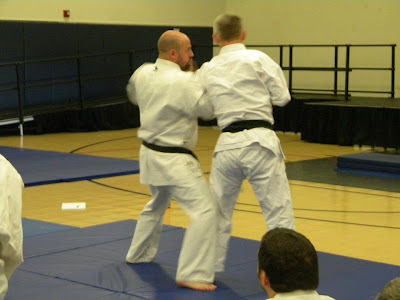 As I still had his lapel we both went down but I ended up in side control. We never stayed on the ground our goal was always breaking free and escaping. Sunday came and we moved on to the Tekki/ Naihanchi/ Chulgi series and KuShanku. We looked at individual techniques and then worked them into drills that flowed from one response to another. This went on in earnest for the next six hours. By the end of the weekend both my brain an my body had been well worked. I had the opportunity to work with Iain Abernethy, an internationally recognised karate instructor and meet sixty practitioners from all corners of the U.S.. One other pleasant surprise of the weekend being recognised by people who were familiar with my online cartoon persona "Oldman". Some had seen "Oldman Boobishi" on Chris Caile's www.FightingArts.com and others had seen pages from it published in Iain's online magazine, Jissen. It was a pleasure to work with Iain. I have always felt encouraged in our emails sent and received over the years. I felt that many time over with Iain in person. That to me is one of the marks of a great teacher. Many thanks to Iain. I'd also like to offer a special thanks to Eric Parsons for putting the seminar together. Also, thank you to Sal Belahi a shotokan third dan from Urbana, Illinois. Sal was my training partner for the majority of the weekend. I very much appreciate a training partner that can help keep a fifty one year old karate guy in one piece. I was at that same seminar. What an outstanding time!